The Pixelmator Team released version 1.2.3 of its next-generation Pixelmator Pro image editing app in late November. Pixelmator Pro 1.2.3 added support for importing ABR Photoshop brushes, improved painting performance of all the brush-based tools (including Paint, retouching, and reshaping tools), increased maximum brush size from 1000 to 2500 pixels, enabled you to invert the brush Shape and Grain textures, and improved the preset importing experience. 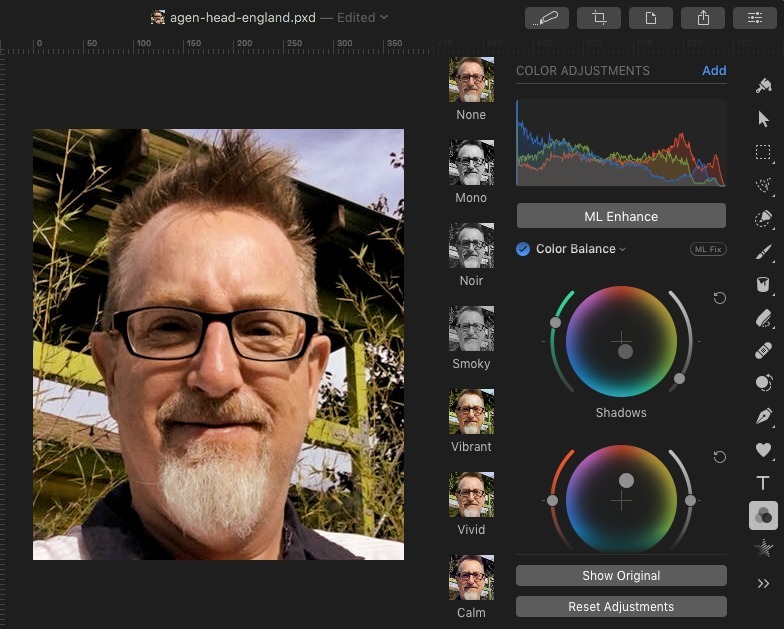 Coinciding with Pixelmator Pro being named Apple’s Mac App of the Year for 2018, Pixelmator Pro 1.2.4 was issued with redesigned color balance adjustment tools that use color wheels inspired by those used in the cinema industry to color-grade films. The new tools enable you to adjust color tints of the shadows, midtones, and highlights, and include sliders for adjusting brightness and saturation as well. Additionally, a Master wheel lets you adjust the color balance of an entire image at once. Was very interested until I read the reviews in the App Store, not a single positive review. That is false. At the moment, I see the summary rating is 4 out of 5 stars (based on 75 ratings). 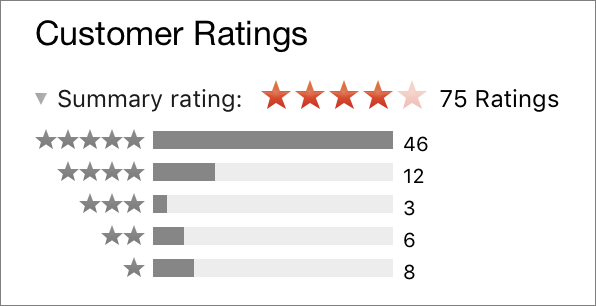 The first page of reviews contains 6 5-star ratings. Maybe you had the reviews sorted by Most Critical instead of Most Helpful? Even sorted by Most Recent is almost all positive reviews. I haven’t used Pixelmator Pro but I have used Pixelmator; I’ve found it to be a good photo editing tool that’s well supported. Sorry Curtis we must be looking at different App stores I can only call it as I see it. I’ve used Pixelmator, and recently a bit of Pixelmator Pro, and found both to be excellent apps. Based on your watchOS message, you’re not in the U.S., I am. Does Apple separate ratings and reviews by App Store region? If the complaints you’re seeing are legitimate, maybe there is a problem with the application’s localization or maybe they’re complaining that it’s not offered in the local language at all (it supports 10 languages but of course there are many more). Or maybe they’re not legitimate, apparently you don’t have to have an app to rate it or write a review. The “most helpful” review I see is one with one star, “Inexcusable lack of Noise Reduction.” The title is not their only complaint, but what they wrote does not justify giving the worst possible rating at all. BTW, your screenshot attachment didn’t come through. I don’t know if it’s supposed to work in email replies, I write all my replies via the web. There’s an awful lot I like about both Pixelmator and Pixelmator Pro, but, sadly, I find it essentially useless, because the tool pallets and toolbars and their text are so ridiculously tiny that I cannot even discern what the individual icons for tools represent, nor can I easily learn the hotkeys with the also-super-tiny hover tooltips, nor can I easily read the current settings in the (seemingly) 10-12 pixel tall toolbars. Yeah, I’m going to switch from my perfect-in-every-other-app resolutions each time I pop over from Photos.app or Pages.app to do a quick adjustment on a photo or ten, perhaps twenty or more times in a single hour. They’ve made it absolutely clear it’s not a priority to do much of anything at all about existing Pixelmator issues; and instead push you hard to move to Pro; but many of the same issues exist there, as well, so I just cannot recommend the app with any real faith or confidence they will ever fix long outstanding bugs that don’t affect, or go unreported by the majority of users. The app may be good, but it’s definitely not great, when considered from an Accessibility standpoint – which should be table stakes for an Apple App of The Year award. If you want a different approach at everyday photo editing, for an affordable price, take a look at Acorn; whose staff is smaller, and extremely focussed on great customer service, support, and bug smashing.